The former judge of the International Court of Justice,ICJ,His Excellency Judge Bola Ajibola has described the life of late Alhaji (Pa) Jimoh Odugbayi who died at the age of 117 as a dedication to the service of Allah. 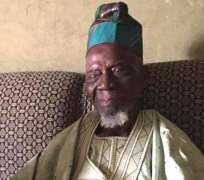 Pa Jimoh as fondly called, aged 117,died last Saturday has since been buried according to Islamic rites. Pa Jimoh Odugbayi, a religious leader, was arguably one of the oldest persons in Nigeria. According to Judge Ajibola,"Pa Jimoh would be missed for his piety,dedication to Almighty God and his words of wisdom to all and sundry". Ajibola stressed that "until his death, Pa Jimoh was a member of the Islamic Mission for Africa (IMA) and a friend of Crescent University,Abeokuta." Ajibola who recounted Pa Jimoh's life as worthy of emulation noted that "even at his 114th birthday, he honoured our university with his esteemed presence at a Special Jumaat Service in 2016 and prayed for growth, success and longevity of our university and its founder." The former Attorney-general and Minister of Justice in Nigeria also described the passage of Pa Jimoh Odugbayi in the following words "With gratitude and submission to the will of Almighty Allah, we announce the passing away of Alhaji (Pa) Jimoh Odugbayi on Saturday 5th of January, 2019 at the age of 117 years", asking God to forgive his sins and grant him paradise.